Catfish are some of the most exciting fish with the characteristic barbells resembling the whiskers of a cat. There are approximately 2900 species on earth, and they also vary in terms of size. Some varieties grow as long as 15 inches and others, less than an inch. Where can you Find Catfish? What do Catfish Feed on? Catfish live in a wide variety of conditions with some of them living in brackish water, saltwater and freshwater. There are some that like stagnant water and some other fast-moving water like a river. There are some catfish active during the night and other during the day. Some of the catfish varieties eat other animals and plants meaning that they are omnivorous. They search for food along the surface and deep within – wherever they may find it. Catfish have very acute senses lined along their bodies and taste buds they use to detect their food. They are thus able to find food in muddy water where visibility is pretty low. It usually is the role of the male catfish to guard the eggs and hatched catfish until they can find their own food. Interestingly, their parenting skills largely depend on whether they are hungry or not. Young catfish consume food they can quickly catch until they reach maturity. This includes small invertebrates such as worms. Other food favorites include hellgrammites, fly larvae, and dragonfly nymphs. Small crayfish also make good prey for them. So, do Catfish Eat Other Fish? The simple answer is, yes. As the catfish grow older, their diets changes and becomes more species-specific. The flatheads touch nothing else apart from the live fish. They typically take cover and grab any fish they can swallow. Channel catfish and bullheads are not too proud of their choice of diet. While they will hunt and eat crayfish, frogs, fish, and cram, they will not ignore the dead and decaying fish. Channel catfish are the real survivors as they vary their diets depending on the season and what is available. Flatheads are meat lovers and will not touch the plant material. However, channel catfish supplement the diet with plant matter that includes the leaves and berries falling in the water. The white catfish is another omnivorous variety that mainly feeds on fish. However, this is not the only food they take. They also feast on aquatic plants, fish eggs, and other boneless sea creatures. The white catfish may scavenge at night, but they are a little different from the other catfish. They love the light. There are also a few catfish that will feed on algae and wood. Some are even parasitic and feed on the blood of other aquatic beings such as frogs, other fish, and rodents. The panaque are a variety of catfish that can efficiently digest wood. They have strong suckers, and tough skin adapted to the environment they live in. Apart from wood, the panaque also find algae sumptuous. The catfish have gut bacteria in their stomachs that break down wood cellulose. One of the most endangered catfish varieties is the Mekong found in South East Asia. It is also one of the largest catfish and can grow as big as 2.7 meters. 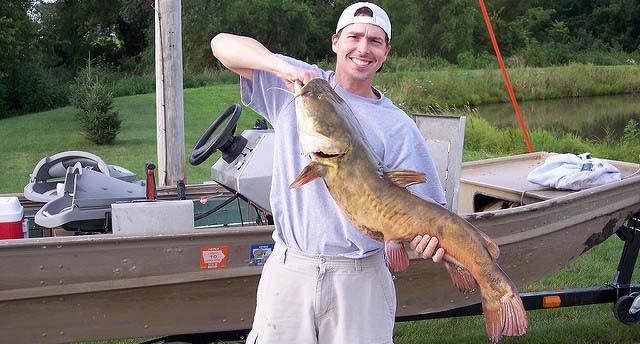 There are records indicating that the catfish can weigh as much as 770lb. The Mekong or shark catfish feeds on algae. However, young Mekongs have cannibalistic behaviors and also feed on zooplankton. This changes to algae when they come of age. This shark catfish eats a significant amount of algae so that they can be as big. However, their habitat has shrunk significantly meaning less food for them, critically endangering them. One parasitic variety is the Candiru found in the Amazon basin – the Amazon apparently has some of the strangest creatures in the world. The Candiru average 7 inches and are typically small enough to embed on the gills of other fish and feed on their blood. These parasitic catfish are quite insignificant and mostly unknown by the majority of people – it may also be the first time you are hearing of them. That said, what do the aquarium varieties eat? Well, the aquarium catfish feed on the decaying organic matter inside the tank. However, this is often insufficient and will need additional food. Feed it the same way you do other aquarium fish people keep as pets. The whiskers of a catfish are there for a particular purpose. The catfish appear when its night to find food when the threat from other predators is low. Furthermore, they can ambush their prey when visibility is low. You may notice that the whiskers are most of the time touching the ground. This helps the fish find worms and other invertebrates – animals without a backbone like a snail and leeches. So, how are catfish so effective in tracking and attacking their prey in the dark? A study conducted in 2001 showed that catfish could detect and follow traces of chemicals left by the swimming fish. According to the study by Kirsten Pohlmann, these trails are what catfish follow and remain undetected until they strike. As animal swims, it leaves footprints on the water in the form of hydrodynamic stimuli and chemical. These ‘footprints' persist for some time after the animal leaves. And through its acute senses on its body and tentacles, the catfish follow these ‘footprints’ to successfully mount an ambush on fish – they never know what hit them. There are numerous species of catfish, but the majority of them share some common characteristics. For example, they have cat-like tentacles that play a significant role in locating their food. The young catfish feed on small boneless creatures in water and insects. Some are also cannibalistic but change this behavior when they mature. But do catfish eat other fish? Well, some of the mature varieties like the flatheads and channel catfish eat fish. Regardless, catfish make an excellent source of food for us.